But where did the Dwimmerlaik come from? From where did they get the power to walk upon the Grand Stair? What we know of them comes only from whispers and rumors…until now. The notes within this volume, found by a young Gossamer Lord as she reveals details of the Dwimmerlaik never before known: their origins, their powers, and their culture. But are these notes to be believed, or yet another trick from a race known for their lies and deceit? 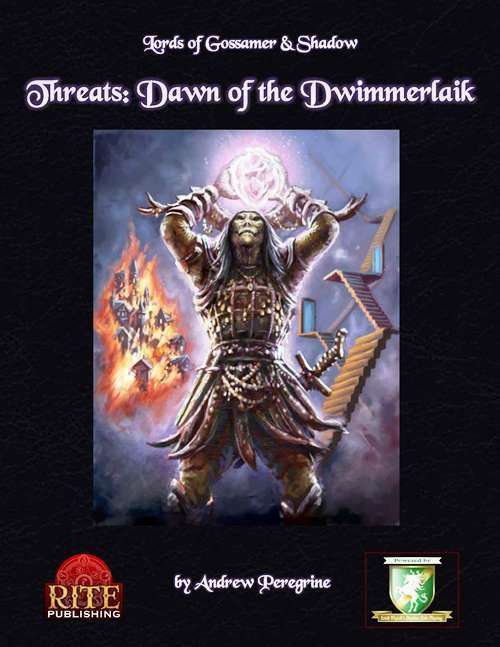 Threats: Dawn of the Dwimmerlaik written by Andrew Peregrine (Doctor Who Rpg Adventures in Time and Space, Victoriana 2nd Editon, etc. )presents the history of the greatest foes in Lords of Gossamer and Shadow by Jason Durall, powered by Erick Wujcik's Diceless Roleplaying.